The Opportunity rover landed on the red planet with its twin, Spirit, in 2004. NASA’s Opportunity rover, originally meant to survive for three months, was declared dead by space agency officials on Wednesday, killed by a massive dust storm after 14 years of roaming Mars. "I declare the Opportunity mission as complete," said NASA's Thomas Zurbuchen at a briefing on the rover. Opportunity landed on Mars on Jan. 25, 2004, rolling out of an airbag onto rusty dirt about three weeks after the arrival of its twin rover, Spirit. 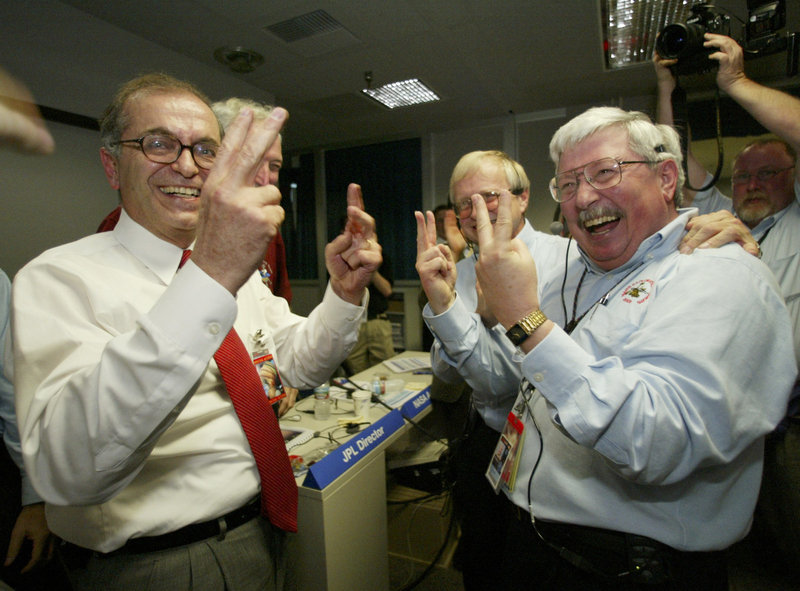 Each about the size of a golf cart, and costing a total of $820 million, the twin rovers jump-started a sagging space agency, triggered tears at mission control and visits to JPL from politicians, and sparked the public’s imagination of exploring the red planet. Investigating craters and traces of waterborne rock beds, Opportunity lasted more than 5,000 Mars days, called “sols,” or about 5,200 Earth days, before its mission ended. The rovers roamed slowly — Opportunity had a top speed of 0.1 miles per hour, and covered just 28 miles in its lifetime — and uncovered past signs of watery geology in the walls of craters, pursuing a NASA plan to “follow the water” on the planet. A rendition of Opportunity entering the Mars atmosphere in 2004. The rovers were solar-powered, and NASA never expected them to live through a Martian winter. They survived by parking on a tilt during winter months to direct more sunlight onto their solar panels. And surprisingly powerful Martian winds reliably cleared the panels of dust. Spirit’s last communication with Earth came in 2010, after it became trapped in the Gusev crater. In June 2018, NASA announced that Opportunity had entered “sleep” mode after a massive dust storm had blotted out its sunlight, draining the rover’s batteries and sending it into a “low-power fault” status that required days to ride out. Despite initial confidence the rover would ride out the storm, NASA officials reported in October that the rover had not revived to independently send a signal after the storm ended, initiating a campaign to sent a wake-up call to Opportunity. The last attempt came yesterday, leading to today’s declaration of the end of the mission. "This is a hard day, and it is a harder day for me because I was there at the beginning," rover project manager John Callas of NASA's JPL, said at the briefing. He speculated that a heater had continued to run during the dust storm, wearing out the rover's battery power. "The time has come to say goodbye," said Callas. "We've done phenomenal things." Opportunity’s 2004 landing was a “hole in one,” in the words of then–mission leader Steve Squyres of Cornell University, rolling to a stop inside a shallow crater and offering the first up close views ever seen of Martian bedrock. Former vice president Al Gore and California’s then-governor Arnold Schwarzenegger were in JPL’s Pasadena control room to celebrate. 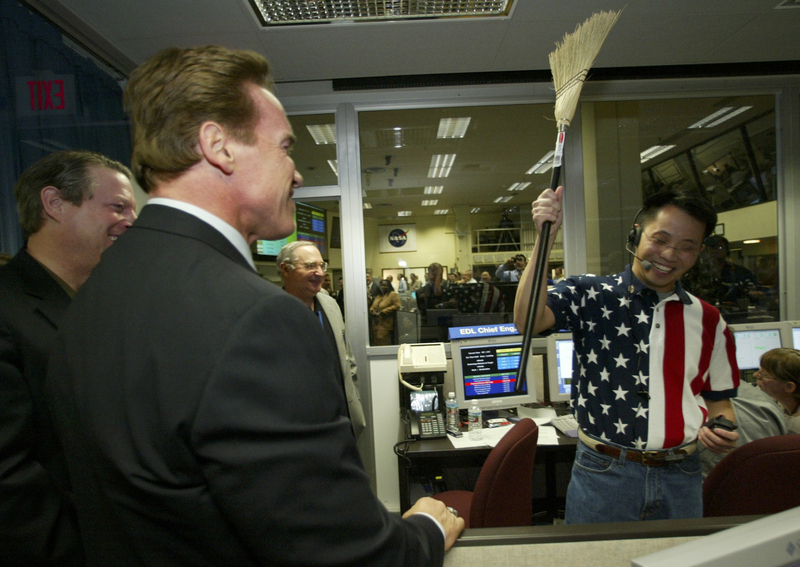 One of the scientists gave Schwarzenegger a broom to mark the “clean sweep” of both rovers successfully arriving at their destination. For the next few months, the rover’s scientific team examined the chemistry of the crater’s walls for glimpses into Mars’ wetter “Noachian” era more than 3.7 billion years ago, a time of heavy bombardment by meteors. Squyres refused to say what rover achievements were his favorites. "I'm not going to help you write an obit," he said, chuckling. "It's too early for that." The rover was declared dead seven months later. In their first year of exploration, Opportunity and Spirit identified rocks that appeared to have been once saturated with salty water, as well as puzzling “blueberries,” iron-rich rocks that were endlessly analyzed by planetary scientists unsure whether they were evidence of past water or volcanic explosions. Eventually the scientists came to view them as residue of ancient water percolating through Martian dirt. The Victoria Crater on Mars. In 2005, Opportunity overcame a sand trap and the loss of one wheel to arrive at the Victoria crater, a 2,400-foot hole that it explored for two years, finding features at its bottom again shaped by ancient water. It next explored the Endeavor crater, 13 miles away, starting in 2011. Most recently it had traversed a narrow valley leading down into the larger Endurance crater. “We voided the warranty on these rovers a long time ago — just got a tremendous return on them,” Squyres said. Opportunity is survived by NASA’s $2.1 billion Curiosity rover, which is exploring the Gale crater for signs of past habitable conditions on Mars. The space agency plans to launch another Mars rover in 2020 to scout for rock samples to return to Earth.